Dr. Rickey J. Shyne joined the staff of the National Aeronautics and Space Administration (NASA) John H. Glenn Research Center at Lewis Field, Cleveland, Ohio, in February 1984. Dr. Shyne was appointed to the Senior Executive Service in August 2005 and was appointed the Director of Research and Engineering on February 3, 2014. In this position, he is responsible for leading and managing Glenn’s research and development competencies in propulsion, communications, power, and materials and structures for extreme environments with a staff of approximately 1100 scientists, engineers, and administrative staff in support of NASA’s aeronautics and space missions. Before his most recent appointment, Dr. Shyne served as Director of Facilities and Test, Deputy Director of Engineering and Technical Services, Deputy Director of Safety and Mission Assurance, and Nozzle Branch Chief in the Research and Technology Directorate. A native of Dayton, Ohio, Dr. Shyne received his Bachelor of Science degree from Tennessee State University (TSU), Nashville, Tennessee, and a Master’s of Science degree from the University of Toledo in Ohio, both in Mechanical Engineering. Additionally, he received the Doctor of Philosophy degree in Engineering Science with a concentration in fluid/thermal sciences from the University of Toledo. He has also completed the prestigious Harvard University John F. Kennedy School of Government Senior Executive Fellows Executive Management Program in Public Policy, the Aspen Institute Executive Management Program, and the Pennsylvania State University Engineer/Scientist Manager Executive Development Program. Dr. Shyne, a registered professional engineer in the State of Ohio, was inducted as a charter member of TSU, Alpha Delta chapter of the Pi Tau Sigma Mechanical Engineering Honor Fraternity. He is the recipient of numerous prestigious honors including NASA’s Exceptional Service Medal for Leadership (2003); National Technical Association (NTA) Engineer of the Year Award (2003); NTA Technical Achiever of the Year Award (2003); NASA Glenn ACES Mentor of the Year Award (2006); US Black Engineer of the Year Award-Career Achievement in Government (2008); National Society of Black Engineers Golden Torch Award for Career Achievement in Government (2008) and a Presidential Rank Award for Meritorious Service (2013) by President Obama from a select group of career senior executives who have provided exceptional service to the American people over an extended period of time. He was recently selected for the 2014 Federal Professional Engineer of the Year Award He was also selected as an Accreditation Board for Engineering and Technology Commission evaluator by the American Society of Mechanical Engineers to review mechanical engineering programs for accreditation. Dr. Shyne has authored or coauthored 16 technical publications and three peer-reviewed international journal articles in the fields of aerodynamics/fluid dynamics and is a co-author of NTA’s book titled Careers in Science and Technology. He is an associate fellow of the American Institute of Aeronautics and Astronautics and also holds professional memberships in the American Society of Mechanical Engineers and NTA. Additionally, he serves on the TSU College of Engineering doctoral advisory committee in computer information systems engineering, the TSU College of Engineering Industrial Advisory Committee and the Central State University Advisory Committee for a National Science Foundation grant on increasing minority participation in science and mathematics. 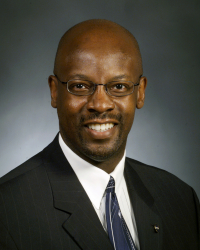 He also serves as an ex-officio board member of the Cleveland Engineering Society and Minds Matter, a non-profit whose mission is to transform the lives of accomplished high school students from low-income families by broadening their dreams and preparing them for college success. He is a member of the Peoples Community Church and is a life member of the Omega Psi Phi Fraternity, Inc. Dr. Shyne and his wife, Eulanda, are the proud parents of two sons, Rickey II and Eric, and they reside in Strongsville, Ohio.